About five years ago I was in Taiwan and got a cheap flight on a special offer with Peach to Okinawa at a great price. Now I'm in Taiwan again and I've been receiving special offer emails from Peach all these years. A new one is on now until tomorrow night. I can see all the offers around Japan, and out of Japan, but not into Japan. Am I wrong in assuming they have the special offers in both directions? Do I need to look on the Chinese version of their site to see the Taiwan-Japan offers? or is there some way to find if the offers even exist in both directions and how to book them? Am I wrong in assuming they have the special offers in both directions? Yes and no. Technically, yes, you are wrong to just assume it, since they can very well sell special fares in only one direction if they wish. However, typically they will sell them in both directions, as is the case here. The full details of which flights are eligible to the discounted fares on which dates are given on the page you linked. Do I need to look on the Chinese version of their site to see the Taiwan-Japan offers? No; the language settings have no effect on fares. or is there some way to find if the offers even exist in both directions and how to book them? Yes, it's all on the page you linked. For example, for flights between TPE and KIX, you have the following. Odd-numbered flights (from KIX) on 4-10 May, from 2,577 JPY. 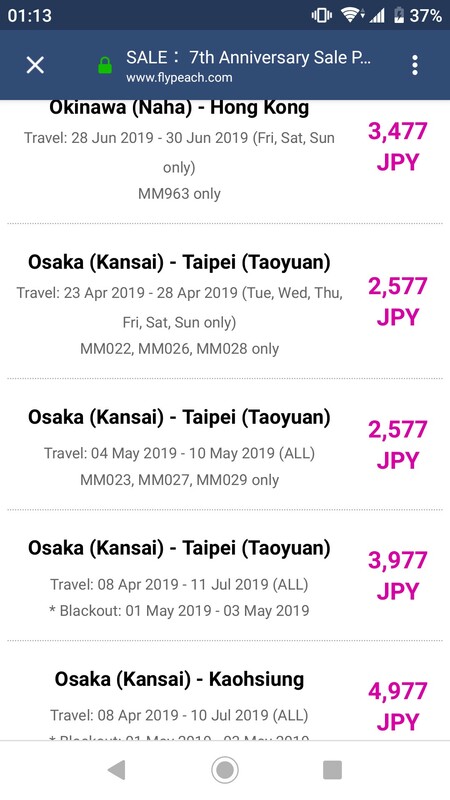 Even-numbered flights (from TPE) on 23-28 April, from 2,577 JPY. All flights from 8 April to 11 July except on 1-3 May and except the above, from 3,977 JPY. Note that "Osaka - Taipei" without further qualification does not mean just from Osaka to Taipei; it means between Osaka and Taipei in either direction. However, some fares are restricted to specific flights, which can effectively make them available in only one direction (e.g., the even-numbered flights are those that go from Taipei to Osaka, so the fare which is restricted to those flights is effectively restricted to the Taipei to Osaka direction). The full list of flights is available from the timetables here. Finally, this should go without saying but since the number of discounted seats on each flight is limited, a flight even on those dates may not have any left (hence "from"). Not the answer you're looking for? Browse other questions tagged japan taiwan peach-aviation or ask your own question. Visa: How specific must the itinerary be when visiting Japan? What do they drink in Japan for breakfast, lunch and dinner? What's the cheapest way to get around from and to Mainland China, Taiwan, and Japan? How to purchase Japan train tickets online and also Japan scenic itinerary?